During a scene from the movie, Laurence of Arabia, actor Peter O’Toole, shouts: “no prisoners!, no prisoners!” These words would aptly suit as a by-line in Wisden 2015. There is no fence sitting in this year’s almanack and the direct style is evident from Editor, Lawrence Booth’s notes. The take no prisoners style is not delivered in a haphazard sensationalistic manner. Every criticism is supported by fact, and praise, when considered deserved, is given with equal facility. Booth starts the direct style by questioning whether ICC Chairman, Narayanaswami Srinivasan, was totally committed to the ICC, after Srinivasan openly stated he considered his first loyalty was to the BCCI. Booth goes on to give the ECB a serve and then turns his attentions to Kevin Petersen (KP). KP seems ubiquitous in Wisden 2015, and apart from acknowledging his fine batting, most of it is of a censorious nature. For the first time, from memory, Wisden even throws in the ‘C’ word. Again it is used in relation to KP and is found in the Cricket in Media section, although there is also a fine balanced piece on KP by Simon Hughes. Even the Book Reviews zero in on KP, tearing into his biography and dismissing it as a diatribe of self indulgence. The Book Reviews are compiled by Patrick Collins and are mostly in agreement with Cricket Web on the best books of 2014, although Collins was not impressed with one of CWs favourites; Field of Shadows. The 2015 Wisden is not all hard hitting opinion however, there are some sadder moments, such as Andrew Ramsey’s piece on Phillip Hughes. Tear jerker stuff and just when you go to dab the tears, the Almanack reproduces in full the moving eulogy by Australian captain Michael Clarke, to start the flow again. The sad death of Phillip Hughes overshadowed some other losses in 2014 and one was the only Test cricketer to reach 100 years. Norman Gordon played for South Africa and managed to make it to 103. Wisden informs that India also lost their oldest Test cricketer with Madhav Mantri passing away aged 92. Apart from deaths in 2014, Wisden also celebrated the 100 year anniversary of the passing of W.G. Grace and Victor Trumper who both died in 1915. The piece on Grace is perhaps the most informative written on the great cricketer. At the end of the article we are informed that its author, Richard Tomlinson, will release a full biography called Amazing Grace in October this year. Based on this Wisden teaser this may well be the cricket tragics most awaited release of 2015. Perhaps the only disappointment in the whole of Wisden 2015 was that no article on the 100 year anniversary of the death of former English captain Andrew Stoddart was included. Surely his biographer and historian David Frith could have penned a tribute to ‘Stoddy’, to complement those on Grace and Trumper. About the Englishman coach of the Afghanistan cricket team, who was driven to and from training and spent the rest of his time in his hotel for fear of being kidnapped (and the English coach thinks life is tough). 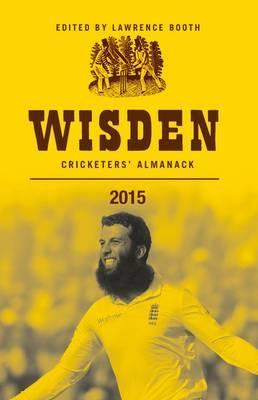 Wisden for 2015 is one of the very best yet produced: informative, melancholy, thought provoking and always entertaining. As such it is highly recommended. Kent's Ed Smith gets to hang out with baseball's New York Mets and draws comparisons between the two sports.